Note One: Bear in mind that the chart above doesn’t include whey-based blends (comprised of, say whey + casein + egg protein powder, e.g. Myofusion or MetRx) or plant-based blends (e.g. Sunwarrior’s Warrior Blends, Vega Protein Powders, Plant Fusion, or Perfect Fit). 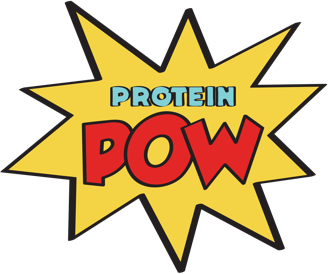 I would place most whey-based blends of protein powders underneath casein though and most plant-based blends underneath pea. 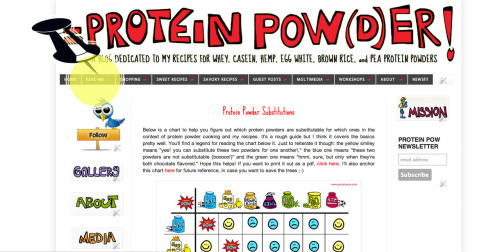 Note Two: Like I said, the above chart is a rough guide to knowing which protein powders to use in place of which ones. It may not always work perfectly given that there are texture-differences between the powders and different brands’ flavoring formulas differ (so that, for example, if you follow one of my protein brownie recipes and substitute a really rich chocolate casein with a mild chocolate brown rice protein powder, you’ll end up with a more subtle chocolate flavored set of brownies). But, nine times out of ten, the chart should allow you to make a good substitution and end up with something just as tasty! Note Three: I’ll upload a chart about Ingredient Substitutions in the September/August Protein Pow Newsletter – to answer questions like: “I notice you use a LOT of coconut flour, what can you substiute coconut flour for?” “I don’t do dairy, what can you substitute cottage cheese for?”, “I’m gluten-intolerant and/or don’t eat grains, what can you substitute oats for?,” “I hate pumpkin, what can you substitute pumpkin for?”, “I utterly abhor beetroot, what can you substitute it for in your recipes?”, etc.